Marvel’s Spider-Man establishes Norman Osborn‘s rival to Horizon High with Osborn Academy; a school created entirely so that his son Harry can have the resources to continue his studies. Naturally a school needs to be attended by more than one student so a fair chunk of this episode focuses on recruitment for the newly minted school. This mostly plays out in a very typical way through a montage of interviews which includes Flash Thompson (Ben Diskin) -who shows a lack of intelligence by thinking that genes refers to an article of clothing- and Anya who wants to cover her bases. It’s not a bad sequence but it’s not an especially good one either and there’s not a lot to say about it other than Anya’s contribution being amusing enough. 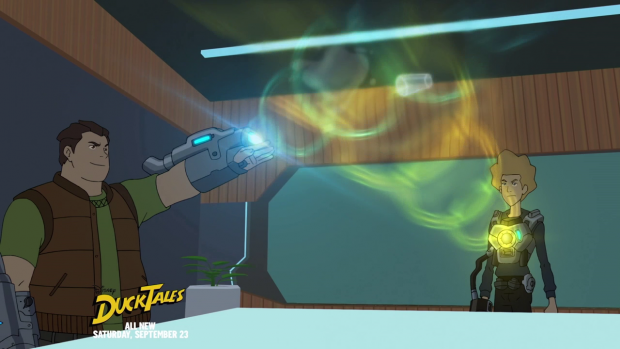 There is also a brief cameo from John Jameson (Josh Keaton) who talks about his interest in space. Most notably is the audition from Clayton Cole aka Clash and (Yuri Lowenthal) Herman Schultz aka Shocker (Cameron Boyce). These characters are reimagined as best friends who invented tech that combines naturally. Norman Osborn (Josh Keaton) encourages them to compete to gain a single place in the school and their teenage rivalry quickly escalates to the point of a full on supervillain throwdown that puts bystanders in danger. This was a good idea in theory as it shows how ruthless Norman Osborn can be. He essentially tries to tear a long standing friendship apart and appeals to their sense of greed for what the purpose of his own amusement as far as I can tell. The idea somewhat falls apart in the execution as the pair went from accidentally using their tech against each other to a full blown attempt to defeat the other in very little time. I didn’t find the transition believable and it goes against how strong this friendship was supposed to be. The effort to make villains that are sympathetic instead of being outright villainous is appreciated but the villain problem that existed in the first two episodes still exists. Another thing that doesn’t really work is that Norman Osborn isn’t suitably punished for pitting the two friends against each other. It is addressed but it happens far too late to really make sense. I see what the writers are trying to do with Norman Osborn but it doesn’t translate as well as it could. 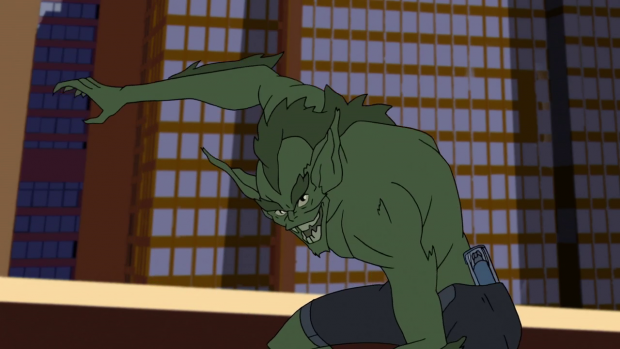 The Jackal also appears as a villain in this episode and he is a lot like Vulture and Scorpion from the previous episodes in that he simply appears with very little context. Spider-Man is chasing after him in the opening sequence and he appears later to steal Clayton and Herman’s tech to use for himself. The introduction of the Jackal (John DiMaggio)works a lot better than either Vulture or Scorpion because there is meant to be something of a mystery to him. 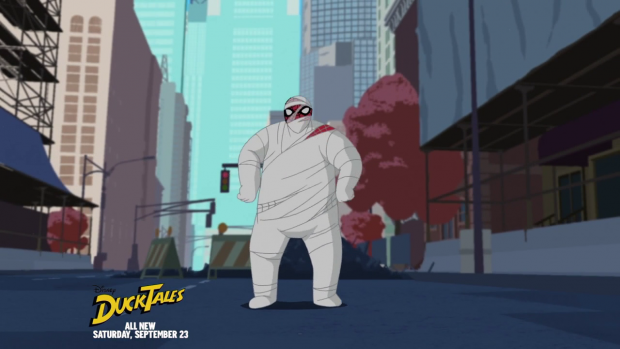 Ending the episode on him transforming back to a human and revealing him to be Gwen Stacy‘s (Laura Bailey) Uncle was a good twist that could prove to be an interesting alteration to the Jackal’s back story. 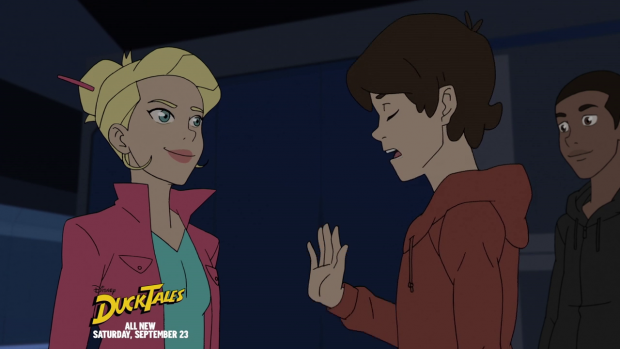 After being mentioned in the previous episode, Gwen Stacy is introduced here. So far she is confident and self assured to the point where she feels comfortable telling Spider-Man how to do his job. She appears to be Peter Parker’s intellectual superior so far and the back and forth she has with him in his Spider-Man identity is entertaining. It’s largely unclear what dynamic she will have with Peter when he is in his civilian identity but it was a solid introduction to the character that cements her as a welcome addition to the cast. Harry gets a lot of development in this episode mostly through his relationship with Norman who clearly cares about his son but he’s also very harsh and expects a lot from him. This is a familiar foundation to the relationship these characters have if you have seen or read other versions of Spider-Man so it makes sense that the show would go down this route. I would say that the basis of their relationship is a lot stronger than other versions but there’s room for that to break down if Harry doesn’t meet his father’s lofty expectations. It is strongly suggested that Harry will go down a villainous route as he tries to prove himself to his father. Norman Osborn as a character is somewhat undefined at this point beyond being very competitive as well as cold and uncompromising. There’s room for him to develop certainly and his relationship with Harry works well with very little screen time. Former Spider-Man Josh Keaton does a really good job voicing him and brings a sense of something elusive lurking beneath the surface for him. He may not be a villain at this point but he’s definitely no saint. The opening of Osborn Academy does something very significant for the groundwork of the show. It puts Harry and Peter in direct competition with one another. The breakdown of the friendship between Herman and Clayton could foreshadow a similar breakdown in Peter and Harry’s friendship. They have a long talk about not ending up that way while heavily hinting that they are headed exactly the same way. This makes for some really clumsy foreshadowing but based on the work done to establish these characters as good friends it does more or less work. Having Harry hate Spider-Man and see him as anything but a hero plants more seeds towards the breakdown of this relationship as Harry is bound to learn the truth about his friend sooner or later which will give him more of a reason to mistrust Peter. This episode handles the action a lot better than the previous outings. I criticised both episodes for failing to use Peter’s intelligence as a way to defeat villains in a satisfying way but this episode does a much better job. His brainwave about using his webbing to create a full body shock absorber was a really nice touch and nicely shows Peter’s ability to think on his feet. His victory may amount to punching tech so that it breaks but what he had to do in order to get close enough to do that was nicely done. The opening action sequence where he accidentally damages two helicopters shows how much he still has to learn as well. A solid episode that introduces major characters into Peter’s life. Gwen Stacy comes across well here and already has a fun dynamic with Spider-Man with limited interaction between her and Peter when is out of the costume. She’s confident, very intelligent and incredibly self assured which blends into the fabric of this show well. Norman Osborn’s introduction establishes the character in largely broad strokes but his relationship with Harry comes across clearly. The fact that Harry will have to continually prove himself will definitely be a challenge that develops over the series. This episode uses the villains better than it has. The reveal of the Jackal as Gwen’s Uncle was nicely done and the breakdown of the friendship between Clayton and Herman worked well enough though escalated a little too quickly. Their role in the episode was largely to foreshadow a similar situation potentially developing between Peter and Harry which comes across as a little clumsy but is interesting all the same.